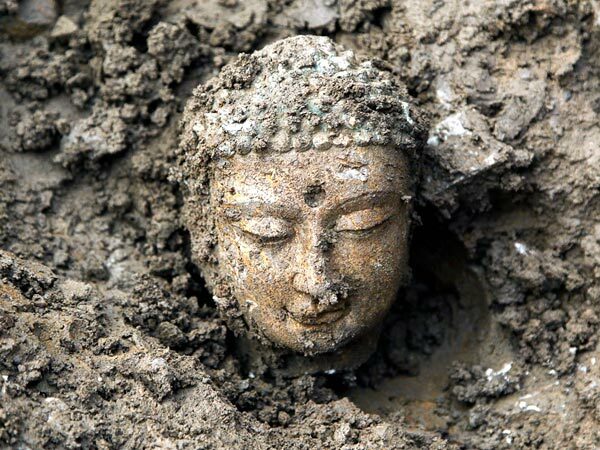 The head of a Buddha statue peeks above the dirt in Handan , China, where archaeologists have reportedly unearthed nearly 3,000 Buddha statues, which could be up to 1,500 years old. The discovery is believed to be the largest of its kind since the founding of the People's Republic of China in 1949, an archaeologist with the Chinese Academy of Social Sciences told reporters in late March, according to the Associated Press. The Buddha statues—most of which are made of white marble and limestone and many of which are broken—could date back to the Eastern Wei and Northern Qi dynasties (A.D. 534 to 577), experts say. 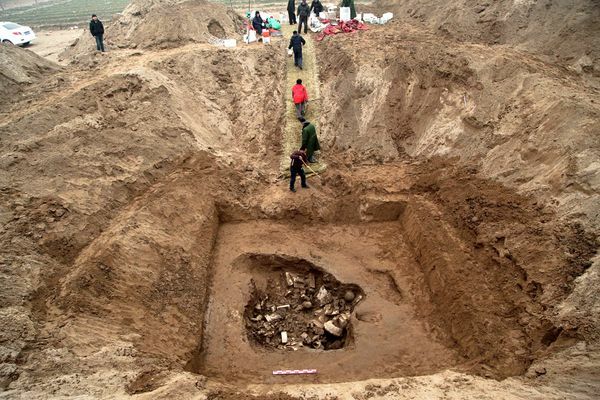 The statues—discovered during a dig outside of Ye, the ancient capital of the Eastern Wei and Northern Qi dynasties—may have been rounded up and buried after the fall of the Northern Qi dynasty by later emperors in an attempt to purge the country of Buddhism. 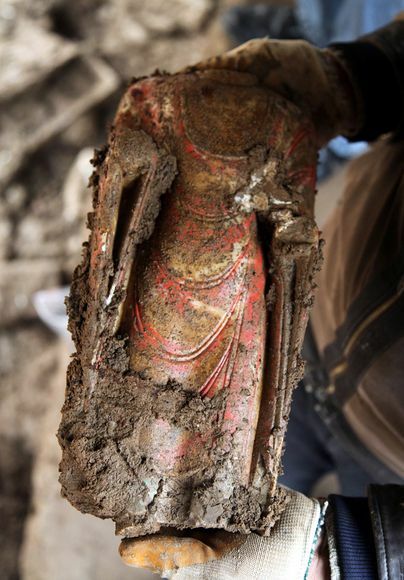 "It may have been that some of the ruins and broken sculptures from the past were gathered from old temple sites and buried in a pit," said Katherine Tsiang, director of the Center for the Art of East Asia at the University of Chicago. In some cases, the Buddhist statues may have been buried by the faithful themselves in times of danger. "In other sites, there are inscriptions that suggest that old damaged sculptures were not just dumped in a pit, but respectfully buried in an orderly way," Tsiang said. On March 20 Chinese archaeologists stand at the edge of a pit where thousands of ancient Buddha statues were unearthed in January. The statues range from about 8 inches (20 centimeters) long to life-size. While rare, such finds are not unheard of, Tsiang said. In the 1950s, for example, archaeologists found more than 2,000 fragments from broken marble Buddha statues at the site of a temple in Dingxian in China's Hebei Province. "Many sculptures from these sites are similar in style to those found recently at Ye," Tsiang said. But this "may be the largest find. I don't know of larger examples." The fifth and sixth centuries were important periods for the spread and development of Buddhism in China, she added. "We know that Buddhism"—which began in India around 500 B.C.—"was introduced to China during the Han dynasty" several hundred years before the newfound artifacts are believed to have been created, Tsiang said. "At first, it may have only been practiced by foreigners. ... Gradually it became much more popular after the Han dynasty fell. And by the fifth and sixth centuries, there was quite a lot of trade across the Silk Road into China from Central Asia. "So [Buddhist] monks from India were coming in, and Chinese monks were traveling and learning. There were also translation projects, so the texts of Buddhism were being translated into Chinese." A Chinese archaeologist gingerly holds an ancient headless Buddha statue, one of thousands recently uncovered in a pit in northern China. Such "freestanding" Buddha statues—typically shown wearing monk-style robes like the one shown here—were widely made in northern China from the middle of the fifth century A.D. onward. Before this time, the Buddha was usually shown standing in a group, with pairs of attendants. The life-size or nearly life-size nature of the freestanding Buddha and the lack of a standard body type or facial expression for the statues have led some scholars to speculate that the sculptures were results of a new understanding of the Buddha in human terms, rather than as a supernatural divinity or immortal.